I don’t know what provoked me to make chips with cabbage but I love it. It’s an easy paleo breakfast recipe. There’s a salty crispy chip with a noodle like cabbage, burned slightly because I’m weird like that. I eat it for breakfast with an egg and I enjoy it as a side dish for supper. That’s right, a two for one paleo recipe. Lately I’ve been making everything with sautéed cabbage. Sorry, you’re going to see a lot of this in the coming paleo recipes. It’s one of my current obsessions. It started with raw sauerkraut but now cabbage is taking over my life. I’ll walk into the grocery store on a mission to get cabbage, pick up two big balls of cabbage, cradle them with two arms and walk to the cashier. I get a lot of looks from guys. Cabbage is probably ruining my dating life too. It’s hard not to say when asked what are your hobbies on a date, “well, making things with cabbage.” No wonder I don’t get past a first date. Here’s a recipe that will change your breakfast or dinner. 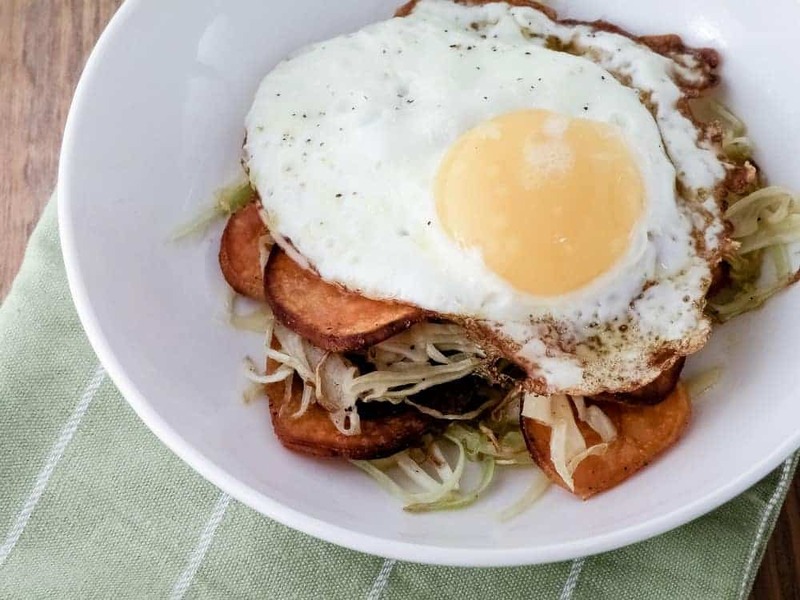 How could it not be fun to eat chips for breakfast? Slice the sweet potato thin like a chip. I recommend using a mandolin. Pour enough olive oil into the pan to lightly fry the sweet potato slices. Turn the pan to medium. Place the sweet potato slices into the pan, sprinkle salt on them and flip when one side is crispy and sprinkle salt on them again. Done when both sides are crispy. 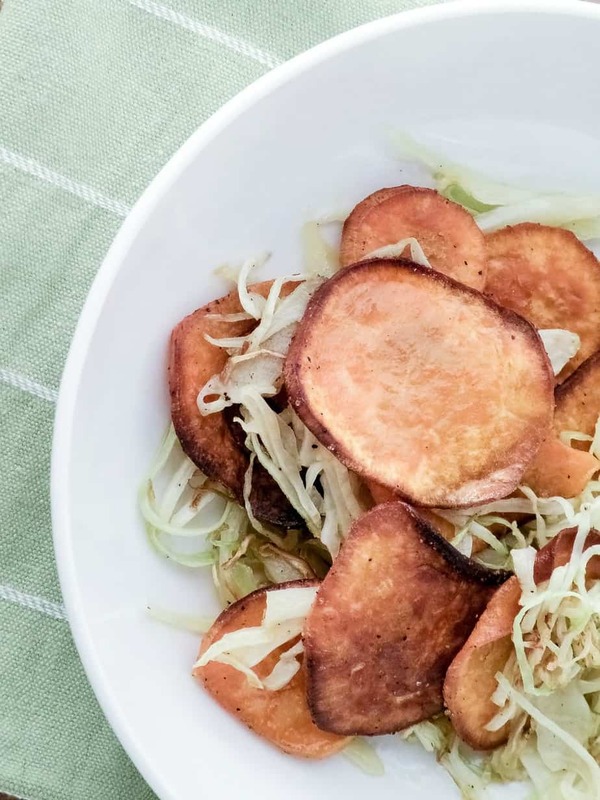 Take out all of the sweet potato chips and place on paper towel. Place the cabbage in the oil and saute until desired crispiness. I prefer it to be well done. When the cabbage is done take out of the pan and mix with the chips and serve.